12 cans of 14 oz OSTER Clipper Cool 5 IN 1 Blade care 14 OUNCE Aerosol Spray Brand New Blade friction heats up clipper blades, increasing the risk of irritating dogs' skin. Friction also increases the amount of strain exerted on your clipper's motor and dulls blades faster. 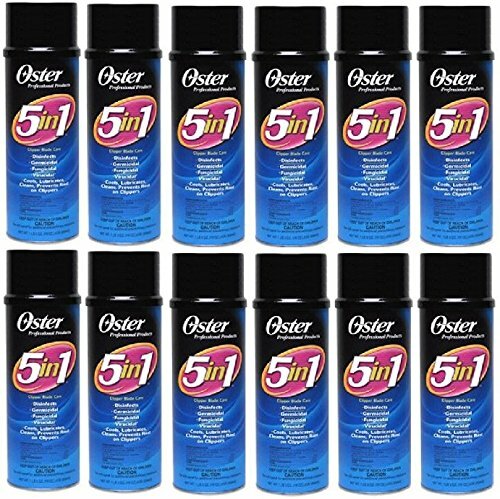 Oster 5 in 1 is an easy-to-use spray that instantly cools, cleans, and lubricates clipper blades. Get red of DIRT, HEAT, HAIR, BACTERIA, CONTAMINANTS, RUST & DRYNESS PROTECT YOUR CLIPPER AND BLADES Can be used with Any Brand Blade such as Oster CryogenX & Elite Blades Andis CeramicEdge, UltraEdge or ShowEdge Blades Wahl Competion & Ultimate Competion Blades Master Grooming Tools HLD, Ceramic Blades Geib Buttercut Blades DuraEdge or Value-Groom Blades, Shearmaster, Clipmaster, Showmaster etc... *Helps Blades Stay sharp and last longer! Cools, Cleans, lubricates, and conditions the metal Blades stay sharper longer No need to remove blades from clipper Safe for everyday use. ALSO GREAT For Scissors, Shears, Grooming Rakes, Combs and other Tools. No blade removal required. Oster 5 in 1 sparay blade coolant, disinfectant, lubricant, cleaner, and rust preventative all in one. Improves cutting action by increasing blade speed. Regular use while clipping and use after clipping is done will EXTEND THE LIFE (SHARPNESS) OF YOUR BLADES and also the motor life of your clippers Increase efficiency and save time and money Formulated for hair stylists, barbers, Professionals, animal groomers and vets. Washes away hair and buildup Removes bacteria Works with ANY brand of blades, Shears, trimmers and clippers-Oster, Andis, Wahl, Laube, Conair, Master Grooming Tools, Top Performance, Value Groom, etc. blades Also great for cleaning any grooming tool-rakes, strippers, combs, etc. Used by Professional Groomers, Barbers, Stylists, Handlers, Veterinarians, etc.